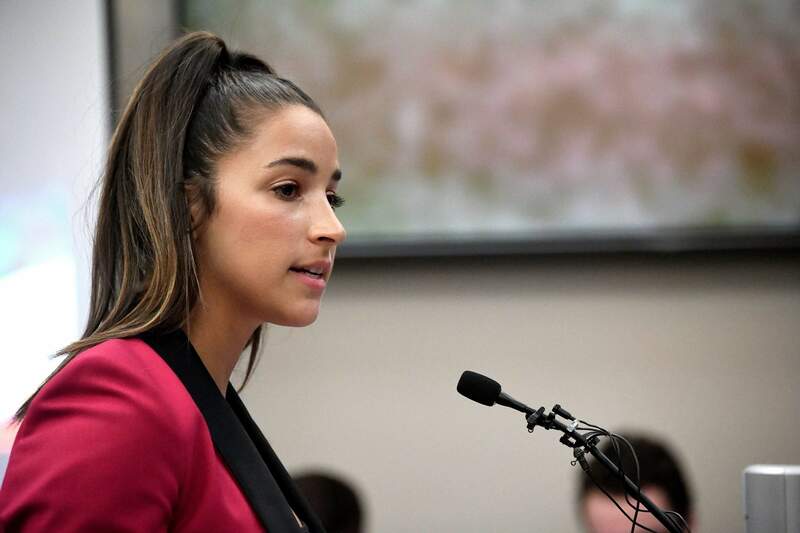 Olympic gold medalist Aly Raisman gives her victim impact statement in Lansing, Mich., during the fourth day of sentencing for former sports doctor Larry Nassar, who pled guilty to multiple counts of sexual assault. The six-time Olympic medalist is suing the U.S. Olympic Committee and USA Gymnastics, claiming both organizations “knew or should have known” about abusive patterns by a disgraced former national team doctor now in prison for sexually abusing young athletes. Raisman filed her lawsuit the same day that roughly 115 additional plaintiffs, including a current University of Michigan male gymnast, joined a federal suit against Michigan State University, USA Gymnastics and others. Jacob Moore, a freshman, said he was treated by Nassar multiple times and described a 2016 incident in which Nassar administered acupuncture in and around Moore’s genitalia after pulling down Moore’s pants in front of a female gymnast who was a minor. The suit in Michigan now has more than 250 plaintiffs. USA Gymnastics said in a statement Friday it is doing “doing everything we can to prevent this from happening again by making bold decisions and holding ourselves to the highest standards of care.” The USOC did not immediately respond to a request for comment.